I'm thinking ahead for Mother's Day today. My Mam got a fancy coffee machine for Christmas, so I thought some cute mug rugs would be a nice idea for a gift. This is the work in progress so far. 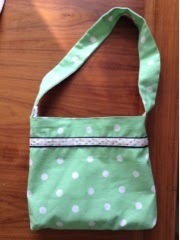 Emily has a party to attend this weekend, so I decided to make a little reversible bag for her friend. I almost got it finished in the time Oliver was at playschool. 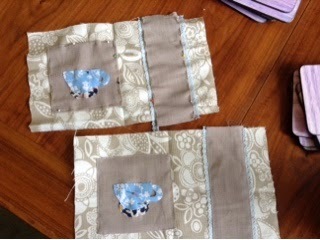 It took a bit longer as I broke a needle - I always seem to when making bags. After that the machine wouldn't work properly. I tried re-threading a few times, changing the needle, cleaning out the lower bobbin case. Last chance saloon was a final go at changing the needle and tightening it up a bit more. Finally it worked. I was close to crying and checking out new machines on the Argos website. Hopefully I've no more drama with it for a while! I feel like I just lost a few weeks of my life! First I got the flu. Then a very chesty cough. And then a tummy bug. And in the middle of that DH was abroad for a few days so I was looking after the kids alone, and very sick. It's one of those times when it would be nice to live closer to my family. So all the crafting I'd done since Christmas ground to a halt. There were days I was too tired to even hold knitting needles. That doesn't happen too often! 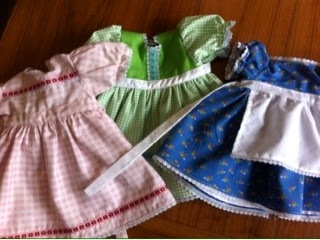 Now I'm back to the dolly dresses. And I'm working on a variation to my Anna-Beth knitted doll pattern. I'm not sure yet if I'll make a pattern of it. Or maybe offer the variation as a freebie. It depends if it looks nice once done I suppose! What a difference a change in scale can make. Both these doll faces are essentially the same design, but the one on the right has larger features. It creates quite a different look. I'm not totally sure which I prefer. Last week I was struck down with flu, and it got me pretty good. So all the creative momentum I'd built since Christmas had to be paused. Which was very hard for me. Now I'm over the worst , and just have a bad cough and runny nose. Oh the joys of the head-cold. This week has been mostly about tidying up the house and getting back to normal. I made some cute buns for the after-school snack. 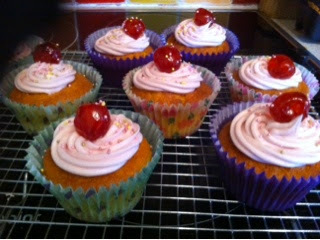 Pink icing, cherries and sprinkles- what's not to love about them! And I've slowly been getting back to creating. 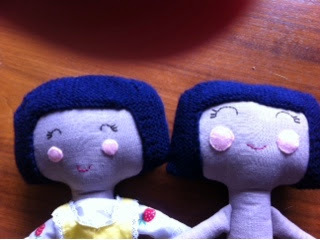 My new large rag dolls have finally had their arms and legs attached. Now I'm working on knitted hair and a more embroidered face. 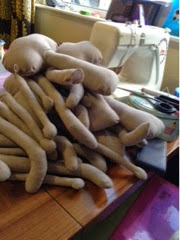 So most of today was spent stuffing doll body parts. I'm redesigning the large cloth rag dolls I make to sell. Instead of calico for the skin I've switched to a linen-look cotton in a taupe colour. I think it gives a nice bit of extra colour to the skin. My next job is to try work out an embroidered face that I'm happy with, rather than the cut out felt one I've used up til now. Or maybe a combination of embroidery and felt? Then I want to make some knitted hair. Something that would give them a unique look as not everyone mixes sewing and knitting when making toys. It might not work. Now I better take a break and make the kids some dinner! Its been so long since I added a new pattern to Ravelry, that I had kinda' forgotten how. It took quite a while, but its up now! !